These pinch pleat drapes shimmer and shine in this ultra chic and formal dining area. The silver and white color scheme is offset by touches of black and deep brown. Fabric patterns are kept to a minimum, allowing the furnishings to take center stage in this elegant and dramatic room. This cozy yet traditional sitting area showcases its tall ceilings and curved windows with graceful pinch pleat drapery mounted at the ceiling line on decorative hardware. The long panels match the wall color in order not to overwhelm the room and can be closed to offer privacy and filter sunlight. 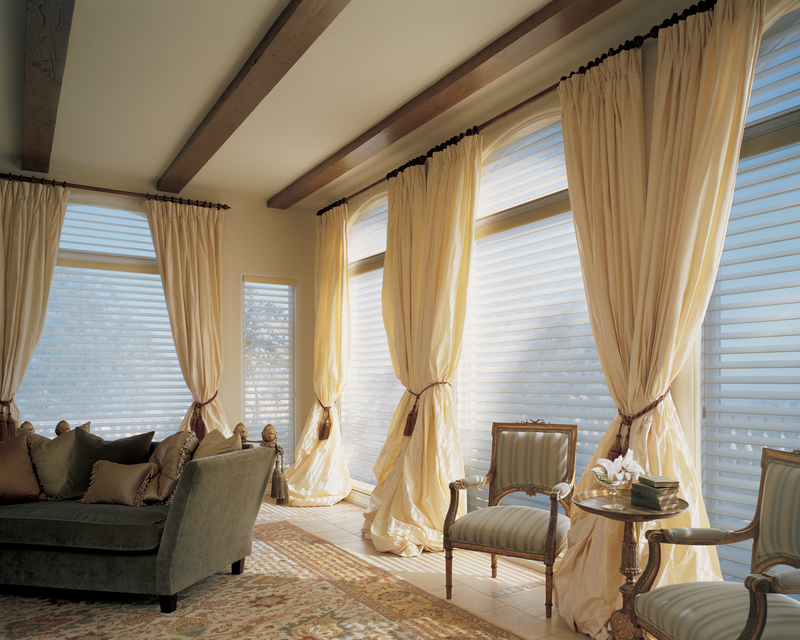 These bespoke pinch pleat drapes will make quite a dramatic statement as they luxuriously frame your windows. Hung from traverse rods at the ceiling line, the fullness of the fabric gracefully pools to the floor and is held back by braided tassel tie backs – creating the perfect touch for this elegant living room.